We strive to maintain the original huntingcharacteristics in the Cesky fousek. Therefore we only use dogs for breeding with proven usefulness, this applies to both males and our own females. In other words: we breed gundogs, needing to work! 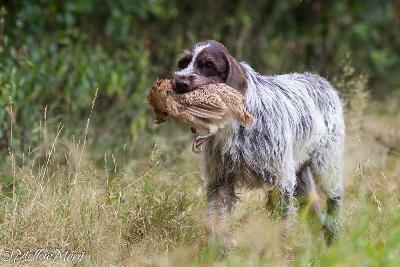 The history of the Cesky fousek clearly shows that the breed was appreciated both for its hunting characteristics as well as its pleasant character. Many people in the years have committed themselves in an effort to preserve these characteristics. It is thanks to these people that today we can still work an live with the same type of Cesky Fousek, and so we try to select for breeding with the same goal. The Netherlands of course cannot be compared to the Czech Republic, since hunting opportunities are different, and also how the dogs live in the Netherlands is not similar to the Czech Republic. So we look upon not just working skills but also the right character. In the Netherlands we all live on a limited space, we need to share this space as well as we can with many more people and many more dogs. This goes both for people, and for (gun)dogs as well. So this requires dogs with a stable character. A dog is allowed to be reserved but never frightful. He is allowed to be tough but never nervous nor aggressive. Fortunately, the average Cesky Fousek is a dog that responds to the profile above, and in our own breeding kennel we try to maintain these characteristics! If you are interested in adopting a puppy, we would like to make an appointment, and invite you to our house in an effort to get to know each other.